We do not know exactly how Henry VIII and Anne Boleyn’s relationship began but Henry’s letters to Anne, written in 1527 and 1528, offer us a unique insight into their relationship and although we do not have Anne’s replies we can guess the content from Henry’s letters. 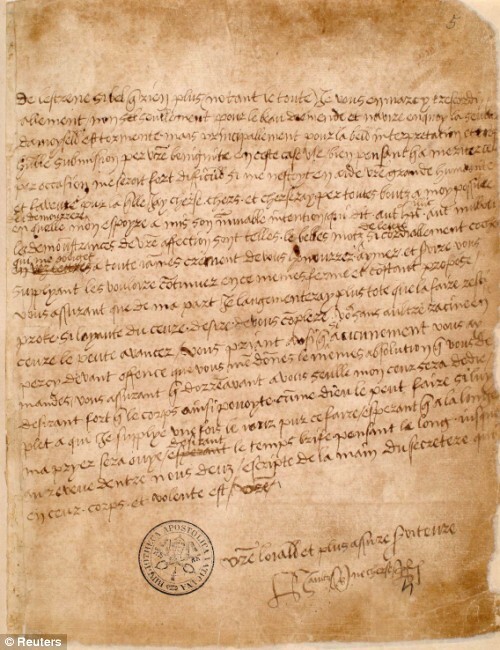 I apologise for numbering my collection of letters differently but I did not think it right to include Anne Boleyn’s letter to Wolsey (11th June 1528) in the collection of love letters. If you want to read Anne’s letter to Wolsey, you can so so on our Anne Boleyn Letters page. The first three in which “Henry was trying to turn the conventions of courtly romance into something more serious” whereas “clearly, Anne was being chary of the King’s attentions” – Ives has 3, 2 and 1 as the order of the first three letters. We see Henry courting Anne, his confusion by his feelings and the signals being sent out by Anne and his plea for a straight answer regarding whether Anne was willing to become his maîtresse-en-titre, his official mistress. 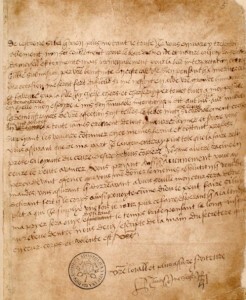 The final group which Ives believes were written between December 1527 and October 1528, following Henry’s decision to ask the Pope for a dispensation so that he can marry Anne. The fact that these letters are in the Vatican Library suggests that they were stolen from Anne, perhaps to use as evidence of Henry’s affair with Anne and to show that that was the real reason for him wanting an annulment of his marriage to Catherine of Aragon. It is sad that they were taken from Anne, as the fact that she kept them shows that they really did mean something to her, but it is good news for us because it means that they were preserved so that we can enjoy them today. Letter 1 when he writes of how he has been “stricken with the dart of love”. Letter 3 which he sends with “a buck killed late last night by my own hand, hoping that when you eat of it you may think of the hunter”. Letter 4 when he sends Anne his “picture set in a bracelet”. Letter 5 which he ends with “H. aultre A. B. [AB in a heart] ne cherse R.” meaning “H. seeks no other than AB” – the modern equivalent of “HR 4 AB 4 Ever” written in a heart! Letter 8 when he is obviously really worried about Anne having sweating sickness. Letter 13 which is signed “H. no other AB seek R”. Letter 15 in which Henry writes “wishing myself (especially an evening) in my sweetheart’s arms, whose pretty dukkys I trust shortly to kiss” – “dukkys” are breasts! Ooh er! Whatever our views of Henry VIII, it is clear that he loved Anne deeply and that she gave him cause to believe that she felt the same way about him. Although Henry later spoke of Jane as being his “true wife”, I think that Anne was his true love and passion, after all, he speaks in Letter 1 of being “stricken with the dart of love” for a “whole year” and he fought tooth and nail to possess her, even breaking with his beloved church and upsetting his family and friends. While some people believe that Anne Boleyn was playing a game and that she seduced Henry and trapped him to gain the crown, I cannot believe this. Henry’s letters show us that Anne started off by snubbing him, by rebuffing his advances and by removing herself to Hever; a dangerous strategy if she really was playing a game as she could not have foreseen that Henry would fight for her, it would have been more likely for him to move on and find another woman who would agree to be his mistress while he looked for a foreign princess to marry. How could Anne have known that Henry would not give up? I cannot and will not believe that Anne dangled her virginity as bait for the King, the evidence just does not support that theory. You can read these letters on our special Henry VIII’s Love Letters to Anne Boleyn page or by purchasing the book Love Letters of Henry VIII to Anne Boleyn. *In Letters and Paper, Foreign and Domestic, Henry VIII, there are various references to “the sweat” in June and July 1528, including “On Tuesday one of the ladies of the chamber, Mademoiselle de Boulan, was infected with the sweat. The King, in great haste, dislodged, and went 12 miles hence, and I hear the lady was sent to her brother the Viscount in Kent” which was written by Du Bellay on the 8th June 1528 (LP iv.4391). Henry was sooo romantic in his letters… I love how he wrote their initials and little hearts.. If I were Anne, I would definately feel flattered, but also moved from the intensity of the King’s feelings. I always thought that only a woman in love would keep the letters her beloved sent to her.. Anne was certainly feeling something for Henry to treasure them. I think Anne was Henry’s first real “love”–he married Katherine for political reasons and maybe to slap at his father who, as I recall, didn’t really want that match. I think he also liked the idea of ‘saving’ Katherine as she had been poorly treated since Arthus’s death. But Anne bowled him over and when she rebuffed him, it just added to his passion. He loved the hunt and Anne, unintentionally I think, fanned the flame of love by running away to Hever. She was his equal in intelligence, wit, courtly manners and dancing, music and languages. She was well-born and cultured, a worth mate for him. I think he fell for her–oh, wouldn’t it be wonderful to find one of her letters to him!! Wonder where they went??? You make a terrific case for Henry’s true love of Anne — no way she could have successfully manipulated him, with so much at stake! Thanks for the article, Claire. I don’t know if I would feel flattered or scared, especially since Henry had strong feelings for her sister and that relationship seems to have fizzled away. I liked the part in the Tudors when Anne tells her father that Henry was known for having short affairs: first he blows hot and then cold, or words to that effect. I can see how someone as charming and intelligent as Anne could easily attract Henry’s attention, but I sometimes wonder if it was more infatuation than love. Sometimes I get the feeling that Henry’s true love was himself and that he was not capable of a relationship with others as he could turn on people so quickly. I agree completely with your last sentence. The only person Henry ever really loved was himself. I’m sure he believed he was capable of loving another human being, but I think Henry was in love with the idea of being in love. True love can’t be turned off so easily and quickly that a man would kill the woman he adored without giving her the chance to defend herself. He turned on Anne like a rabid animal; that’s not love, that’s the action of a shallow, selfish obsessed man. I forgot to say that I do think Anne came to love Henry, although I don’t think she did in the beginning. She may have initially simply been honoured that he appeared to adore her so much, but in the end her love for him, as exhibited on the scaffold, was far more genuine than his love for her. And I don’t think she set out to trap him; quite the reverse. My sense is that Henry tended to idealize women and then fall out of love with them the minute they exhibited human falliability (or the minute he encountered a woman who seemed even more “perfect”). Perhaps the courtly love tradition, with the lady on a pedestal, encouraged this kind of thinking. Henry was infatuated with Anne and he thought that he loved her. Whenever I read Henry’s love letters to Anne I still cannot image how devestated Anne must have been when Henry rejected her in 1536. No one could image that a man so obviously besotted would turn so violently against her a decade later. These letters must have meant something to Anne for her to keep them years later. While I am saddened they were stolen from Anne, their fate would have been different after Anne’s fall. These letters give great insight into Henry’s feelings, far removed from more formal correspondence. I can see why Anne was taken by Henry and his romantic words. I wish we had Anne’s replies, then we could have more insight into her feelings and thoughts! Louise, I think you make a good point about Anne growing to love Henry and I think he could have been charming and affectionate when he wanted to and everything appeared to be going his way, But there is something wanting in his character as he could so easily dispose of people (both literally and figuratively) when he perceived that person as not being 100% loyal to him. I don’s think he could have an adult relationship. There seems to me to be a child like quality about him and heaven help the person who was not seen as being completely on his side. I think Jane Seymour was considered his true wife just because she had a son. The more I find out about the women in his life, especially his wives, the more I have come to respect them and how they coped with being married to such a difficult man. I wonder whether Henry found it so easy to believe in the disloyalty of others because he felt very little personal loyalty to anyone. In other words he judged people by his own standards. I think Anne’s love for him was more genuine because she had more capacity for love and loyalty than Henry was ever capable of. I do believe that Anne was Henrys true love. He fought very hard for her and she did not make it easy for him. Based on what I have read, I also believe that Anne loved him to, though she may not have at first. The love letters between them also prove that he was in love with her because he was not the type of man to write letters. Does anyone know of any love letters written to any of his other wives? Thought most scholars believe that Jane was his true love I have to strongly disagree. ı also believe that Anne was the only woman henry really loved. Lots of people think that he loves jabe seymour most but i think her priority came from the son she gave birth to. katharine howard was so young and beautiful that it was very normal for a middle-aged man wanted to fulfill his desire. Katharine Parr was a sophisticated woman and it looks like they had a logical relationship. I don’t mention about anne of cleves since we all know that henry was really disappointed by her. But only with ANNE,he felt the passion, love and desire which annoyed the whole people around him. In the end right before the kings death he was hunted by his past wife’s and out if all of them when Ann appeared to him and spoke to him as she started to disappear he yelled “Ann please don’t go” I also believe that the king was in Love with Ann Boleyn. Many, you’re speaking of the final episode of THE TUDORS, just to clarify your post for others. I loved that episode. It was a fitting climax to the series, and Henry being visited by the “ghosts” of Katherine Aragon, Anne Boleyn, and Jane Seymour not only was a wonderful dramatization of the thoughts facing a dying king, a dying man, but also a foretelling for those not familiar with the rest of the Tudor story as to what happened to the three children. I think Anne was his true, passionate love–no man will overturn heaven and earth (almost literally, in terms of the English Reformation)–without that driving passion, nor will he wait 7 YEARS to bed her without it. As totally fascinated as I am by Henry and all things surrounding his reign, I don’t believe he loved anyone as much as he loved and served himself. How quickly he rid himself of Queen Catherine after all the years of marriage. Anne denied him and he was infatuated. A mere three years later she was dead, after not producing a son and his eyes falling on Jane Seymour. I believed Jane was revered by him because she produced the son and she died quickly. Who knows what their relationship would have been had she lived. Katherine Howard went the way of the rest, although her adultery was the cause, the King did not seem overwhelmed by her death, either. Katherine Parr came to be Queen when he was unhealthly and she was his willing nurse and comforter. And she did almost get herself in a lot of trouble wirh Henry herself. She was mature and smart enough to save herself and realize what she was dealing with. And poor Thomas More. Another example of Henry turning on those he supposedly loved so dearly. Cardinal Wolsey. These are just my thoughts on King Henry. He was incapable of loving anyone other than himself, not even his poor daughters. Thank you Claire, for this wonderful analysis of Henry’s love letters to Anne. And everyone has very interesting comments and insights to add to the discussion. I also am glad that the letters were preserved by being stolen, as they would most probably have been destroyed after Anne’s death like all of her other possessions. What I wouldn’t give to have the opportunity to view these letters in person! I hope you get to see them someday Claire. I think Anne’s feelings for Henry deepened after Elizabeth was born, while sadly, Henry’s went in the opposite direction. But what a passionate affair they had, something Henry never experienced again in his life, I’m convinced.